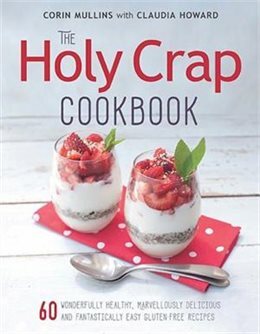 Be sure to stop by on Sunday, October 30 to meet Claudia Howard, the co-author of The Holy Crap Cookbook (Douglas & McIntyre, $22.95; written with Corin Mullins). She will be here from 12:00pm to 2:00pm to sign books, give out bags of her famous Holy Crap cereal, and entice us all to enter a prize draw for a special Holy Crap gift basket! “When Corin and Brian Mullins started their company, HapiFoods, in 2009 with just $129, they had no idea that in less than a decade they would be shipping millions of bags of cereals around the world. They just wanted to make a nourishing product that would both taste good and be compatible with Brian’s food allergies and perhaps sell it locally for a bit of extra retirement income. After much experimentation, Corin came across the tiny black chia seed – a complete protein, rich in omega 3 fatty acids as well as minerals, antioxidants and fibre. Corin blended chia with nutrient-rich buckwheat and hulled hemp seeds and, inspired by an enthusiastic comment from one of their first customers, she and Brian decided to label their first creation “Holy Crap, the World’s Most Amazing Cereal.” Thanks in part to an appearance on the hit CBC show Dragons’ Den, their products gained the attention of Canadian consumers, many of whom became loyal customers. Claudia Howard is a communications professional who lives in Gibsons, BC. She loves experimenting with local ingredients and adapting recipes to healthier versions.